“The Lake Area’s Home Promotion” Gateway Elite Wrestling is thrilled to present it’s next event at Crocker High School in Crocker, MO. A portion of the proceeds will go to benefit the Crocker Junior’s and Senior’s trip to Washington D.C. This event is for ALL ages and will be fun for the entire family! 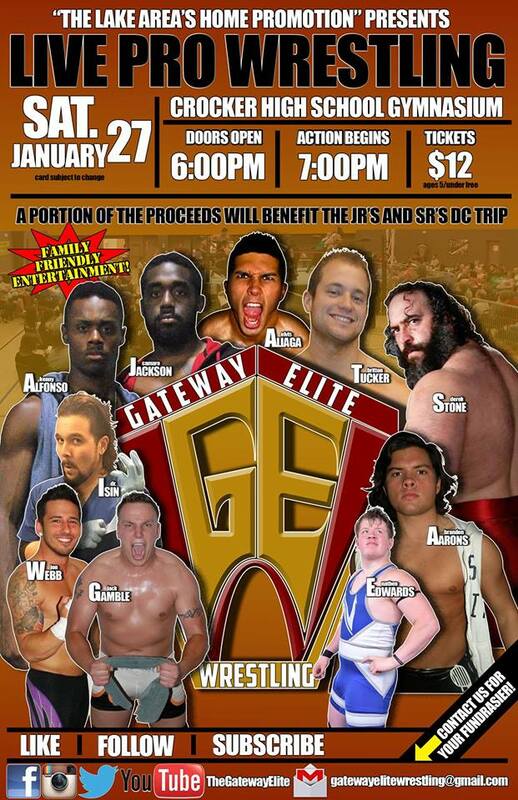 Come out and enjoy an action packed night of LIVE pro wrestling while supporting a great cause! Tickets are just $12 and are available via members of the Crocker Junior and Senior classes. Tickets will also available at the door the night of the event. Kids 5 and under get in free! Doors open at 6 PM and the event will start at 7 PM. This entry was posted on January 7, 2018 at 12:55 pm	and is filed under Uncategorized. You can follow any responses to this entry through the RSS 2.0 feed. You can leave a response, or trackback from your own site.